And so 2016 has come to an end. The year-end function and prize giving was held on 2 December at the Magister hall. And what an evening it was. The hall was beautifully decorated with Christmas lights, flowing drapes hanging from the ceiling and even a lovely Christmas tree in the foyer. A flower arrangement (made by the dojo moms) was placed on each of the tables which added to the festive cheer of the evening. Many, many thanks to the moms and students who spent the entire day breaking their backs and working their fingers to the bone in order to give the hall a magical makeover. A huge thanks also to Pieter for making us a lovely trophy cabinet as well as a stage this year. Solis Ortus is very grateful to have parents who are willing to step up and get involved and contribute towards making our year end function memorable and enjoyable each year. Thank you! It was a very busy year at Solis Ortus this year. Two very successful club grading’s, 11 successful Shodan grading karate-ka and the first ever Coen Memorial Challenge, are to name but a few of the highlights of the year. During the prize giving, each and every student was recognised for their efforts during the year. Not everyone may have received a medal or a trophy, but each student was awarded a certificate acknowledging either their progress and/or their perseverance and/or their loyalty throughout the year. Recognition was also given to those students who participated in competitions throughout the year, be they JKA or KSA. Floating trophy’s were handed over to the top achievers in the various categories. Of course there are also the Solis Ortus awards such as “Most improved Junior” and “Karateka of the Year”. 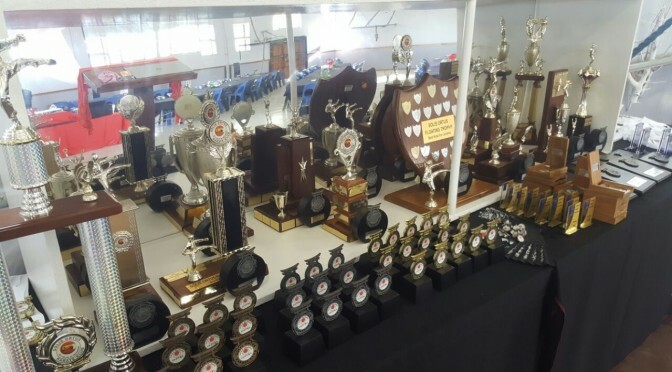 As a Sensei, I am somewhat proud to say that selecting a “winner” for each category becomes more and more difficult each year, as the number of students and the standard of karate at our club increases each year too!! Fortunately, I have fantastic instructors who with their opinions and input, assist me in making these difficult choices. The complete list of awards and the respective winners will be posted on the web-site shortly. Congratulations to each and every student who achieved success in some form or another this year – hard work and perseverance always pays off!! Thanks again to each and every student of Solis Ortus for making 2016 a very successful year. May you all have a well-deserved break over the festive season. Travel safe and I look forward to seeing you all in the dojo again on the 9th of January 2017.